Where blogs gave the printing press to anyone with Internet access, Google+ Hangouts On Air now lets anyone create his or her own “TV station.” YouTube has been around for a long time, so the idea of video shows is not a new one in cyberspace. What is new is the fact you can now use Hangouts to broadcast live, in real time, and have the show archived to your YouTube channel. Today, we are going to take a step-by-step look at what it takes to put on a show like this, as well as offer some general tips and tricks for those brands wishing to utilize this exciting new feature. It is well worth the investment to get a good camera and microphone, especially if you are broadcasting as a brand. While embedded webcams and mics can be used, you can greatly improve your final product by investing in better gear. I also advise that you use the fastest machine available. The faster your system, the smoother the video will be. Make sure none of the participants are relying on a wireless connection. Connecting through a network cable speeds things up and helps prevent audio/video artifacts (like pixelation and sound dropouts). Everyone involved needs a headset, or at least earbuds and a mic. Otherwise, you will experience a lot of unpleasant echoes, a problem that magnifies as you add more people to the Hangout. Look at the video quality of your output. Do you have huge amounts of glare from a window behind you? Does your hair look like Albert Einstein’s — on a bad day? Does your background look interesting? One of the most common issues I see out there is backlighting. Avoid it — unless you want to present yourself as a shadowy figure surrounded by glare (which could work for aspiring mystery men). Start early. There will always be things to troubleshoot, such as getting everyone’s sound and video working. This can take a bit longer if you’re trying to get everyone to use a particular app (I favor Lower Third myself). Also, make sure that everyone you want to join is in your Circles, otherwise you cannot invite them easily. You have a bit of time to get everyone on the same page as nothing goes public until you actually click “Start Broadcast” (YouTube archiving also begins at this point). Everyone involved needs to mute their microphones when not actually speaking. It’s amazing how fast the keyboard noise, breathing, and random ambient sounds can ruin your audioscape. If you are going to do any screensharing, clean up your desktop. Make sure that no personal information or private files are visible, as the screensharing mode shows the entire desktop. Copyright. This is huge. If you don’t own it, and don’t have written permission to use it, then don’t use it in a Hangout. This is the type of thing that cause rapid and unpleasant interactions with those in the legal profession. Creative Commons is a good source for copyright-free or legally shareable images, I’ve been using it for years. While you are preparing to broadcast, open tabs with your various social media profiles. Once you start, you can use these to promote the link in real time, thus expanding your viewership. The Start Hangout button appears in the upper right corner of your screen in Google+. Log into Google+ and click on the Hangout button in the right-hand sidebar. Give the Hangout a name and invite people (you can invite people individually or invite entire circles). If you have guests who are not on Google+, you can add them by phone number. Of course, this will mean that their participation is audio-only. Click the radio button next to Enable Hangouts On Air. If you don’t do this, you will not broadcast and the video will not be saved. You will then be prompted to agree to Google’s Terms of Service. If you are doing this on behalf of a company or brand, you might want to get their legal team to give it a onceover before your initial show. 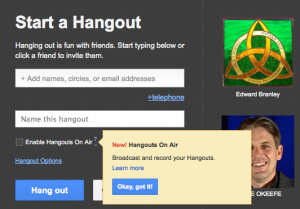 You only have to do that the first time you use Hangouts On Air. Once the people you have invited “arrive,” you are ready to broadcast to the world. Click the big red Start Broadcast button in the upper right corner, and you are live! When you begin the broadcast, the Hangout will appear in your Google+ stream, and you can get the permalink by right-clicking the timestamp at the top of the post. This is the link you want to share in order to promote it. While things are getting started, go to those other browser tabs and start sharing the Hangout link. You can also get an embed code for the video in the upper right corner of your screen. Embed this in your blogs and websites. Make sure to keep an eye on your YouTube channel as it will broadcast live there as well. I find that this is usually one of the platforms where I see the most comments during broadcast. One little known fact is that the originator of the Hangout can override Google’s automatic camera switching. Normally, Google will automatically move whoever is speaking to the main window. The originator of the Hangout is able to click on a person’s pane to bring them into the big window for the viewers. If you want a high-quality video recording, you will need to get a third-party recording application. YouTube does a great job with archiving videos, but they are hardly HD in quality. Once YouTube finishes processing the archived video, it will show up both on the original broadcast post on Google+, and will also appear as a public post on your YouTube channel. A lot of your views will accumulate after the original broadcast. Make sure you embed the video in the easily accessible places — properly optimized and tagged blog posts, Facebook, etc. The power of broadcasting is an amazing thing. All businesses and brands should be sitting up to take notice. Taken alone, it is big enough, but add in the private videoconferencing capabilities, and Google+ becomes a must-have part of any professional’s digital tool kit. For any entity trying to carve out a niche online, the versatility of these tools is self-evident. For instance, I have one client who is getting ready to begin a series of videos in which we interview experts in their respective niches. The private functions are perfect for consulting and for teaching, as well as providing real-time and personalized customer support. Are you using Hangouts or Hangouts On Air? Leave us some links so we can see what other people are doing with them!